Hey guys! It’s Sunday and that means it’s time for another Sunday Game Soundtrack! Football is over… so we need SOMETHING to do, right? Anyhow, let’s listen to the original, legendary soundtrack to a game composed by a husband and wife duo- Rockman 3/Mega Man 3 for FC/NES. This Sunday’s selection was inspired by Close to Good‘s Volume III, which features the complete soundtrack to Rockman 3/Mega Man 3, covered and awesome.. It’s free- you should go download it and take a listen! Okay, so I know you guys know this but for the sake of just saying it: Mega Man is known as Rockman in Japan. The game’s official Japanese title is ロックマン3 Dr.ワイリーの最期!? or Rockman 3: The End of Dr. Wily? Much more dramatic! Anyhow, rather than saying Rockman 3/Mega Man 3 each time I refer to the game, I’m just going to call it MM3 from here on out. Simple. Clean. Easy. 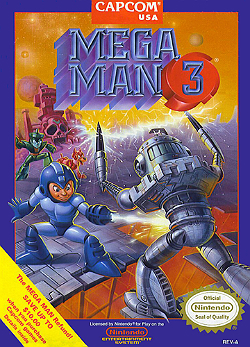 MM3 was released by Capcom for the FC/NES on September 28th 1990 in Japan and in November 1990 for the US. (Sadly, it was not released in the EU until 1992… wow, way to drop the ball, Capcom). This game uses the MMC3 mapper. This mapper (to oversimplify a bit) basically allows Mega Man’s health bar to remain in a static position while you move. The music for the game was composed by Yasuaki Fujita, who is listed as “Bunbun” in the credits. Bunbun wasn’t originally assigned to compose for the game, however. I’ll summarize one of my older posts really quick: Basically, Bunbun’s wife, Harumi Fujita, was assigned to write the music for the game. Unfortunately, she had to abandon the project… because she went into labor. She had been assigned the project while pregnant with her and Bunbun’s child (I’ll recycle this joke because I can: You might say she had a… BUNBUN in the oven). She took maternity leave and Bunbun, who was originally assigned to just do the sound programming, took over the project. Harumi had already started the work so there’s always been a question as to which, if any, of the tracks were hers. Fortunately, Bunbun, on his blog, pointed out which tracks he composed. Apparently, Harumi had already finished Gemini Man, Needle Man, and part of the Staff Roll track. The rest was finished by Bunbun. Anyhow, you’re not here for touching little stories! You’re here for MUSIC. So, let’s take a listen to Bunbun and Harumi Fujita’s Rockman 3/Mega Man 3 complete soundtrack, as posted on YouTube by Wiiguy309 (this guy has posted so many soundtrack- what the heck, man? CRAZY!) These tracks have been stereo enhanced so you’ll notice they sound a little more… reverb-y. It’s kind of nice. If you REALLY REALLY REALLY, REALLY want to listen to the un-enhanced version, you can click here. Hey folks. It’s Sunday and that means it’s time for another Sunday Game Soundtrack! While I spend a lot of time during the week looking for more obscure titles, its also great to find some time to post fan favorites! Today, we’ll listen to the soundtrack to the first generation of Pokemon games for Gameboy- Pokemon – Red/Green/Blue/Yellow. Luckily, I managed to find the complete OST in one YouTube video (always awesome) so special thanks to OnlineOST for posting this. I’ll put the OST below so you can listen while you read along. The composer for this game is Junichi Masuda. He’s basically been the guy behind all the music in the Pokemon series. He has a very interesting style, in terms of composition. I really can’t put my finger on what it is. His battle themes are very busy but still somehow light. If you notice, there’s very little use of “drums” throughout the pieces but it’s still very rhythmic. The version of the music above has been enhanced, clearly. There’s a lot more echo, etc. The music we heard as kids was a lot more jarring. Pokemon was original released in Japan as Pocket Monsters – Red/Green in 1996. The original “Blue” edition was released later, and at first, only to people who were subscribers to CoroCoro Comic. The Blue edition featured enhanced audio (it was just tweaked a bit, from what I understand) and some glitches were removed. When the game was finally released here in the US in 1998, they decided to release the Japanese Blue version. So, our Pokemon – Red/Blue is actually an updated version of the original, in terms of sound. Okay, this is a serious warning. I’ll provide a link to this but listen at your own risk. Seriously. My ears are ringing right now. So Junichi Masuda wrote a different version of the Lavender Town theme for Pocket Monsters Beta game. It is probably the most disturbing, jarring, and bizarre track I’ve ever heard in my life. Like, seriously. You can listen to it, if you want. But this is my last warning. It seriously messes with your head. There are EXTREME high pitches that are inaudible to older folks but can REALLY hurt young kids ears. Crazy right? And yes, my ears actually hurt right now. I’m not even kidding. If you’re going to listen to it, listen to it softly at least and without headphones. Okay. Here’s the link. What a bizarre track. If you end up listening for a long time, you’ll notice there’s a lot of Japanese speaking at the end. I BELIEVE this is the Game Boy cry of each Pokemon followed by the a reading from the PokeDex. I could be wrong but that’s what it sounds like to me. Okay folks, enjoy the OST and hopefully you didn’t listen to that Lavender Town track. I need an Advil. Wow. Ouch. Happy New Year and all that belated stuff! Wow, it’s been over a month since I’ve posted. The holidays were absurdly busy. I’ve been working on a ton of stuff right now (including a MASSIVE Beta Test Music concert on February 2nd… more about that in the next couple posts.) For now, though, it’s Sunday and that means it’s time for another Sunday Game Soundtrack. Today, let’s listen to the soundtrack to the SFC/SNES’s 2nd best selling game of all time, Donkey Kong Country. It’s Sunday and that means it’s time for another Sunday Game Soundtrack. This week, we’ll look at Minako Hamano and Kozue Ishikawa’s soundtrack to The Legend of Zelda: Link’s Awakening for Nintendo Game Boy. Link’s Awakening was released in 1993 and is the 4th title in the Legend of Zelda series. It is the first Zelda series game released for a handheld console. It was re-released in 1998 for Game Boy Color as The Legend of Zelda: Link’s Awakening DX. It was developed to originally be a port of Legend of Zelda: A Link to the Past for Game Boy but got a bit.. well.. lost along the way. The very origins of the game are based on the experiments by programmer Kazuaki Morita during the infancy of Game Boy. Morita would gather other programmers and experiment with the Game Boy development kit during the after hours (they joked that it was like an after school club). After the successful release of Link to the Past in 1991, director Takashi Tezuka pitched the concept of a handheld Zelda game to Nintendo and it was approved. They reassembled the Link to the Past team to help development and thus, Link’s Awakening was born. Link’s Awakening is perhaps known best for the fact that it does not take place in Hyrule. At all. Tezuka instructed script writer Kensuke Tanabe to make the game a spin-off and have a completely different feel. Thus, many of the characters from previous games do not appear on purpose (Princess Zelda, Gannon, etc). This new direction painted a fresh new picture of the series. Many concepts make their first appearance in Link’s Awakening– the ocarina, fishing, fetch quests, hidden items to collect, and more. These were crucial to the development of future titles and became staple elements of the series. The soundtrack features the duo of Minako Hamano and Kozue Ishikawa, both on their first project. While credit is given to Kazumi Totaka for the OST, he was only the sound programmer for the game. 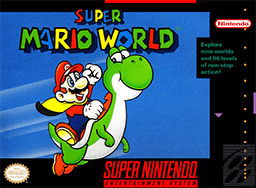 Hamano and Ishikawa composed nearly an hour of music for the game, including remixes of Koji Kondo’s iconic overworld theme. Kondo, who was probably eager to put his mark on the game somewhere, helped compose the ending credits theme… which is coincidentally one of my favorite tracks from the game. Interesting note: Though Shigeru Miyamoto was the the producer of the game, he sat back on his feet and did not provide any creative input to the game. He merely play-tested a nearly complete product and gave input to help implement what was already done. This may explain why the game has a very different feel from Nintendo developed games of the time. 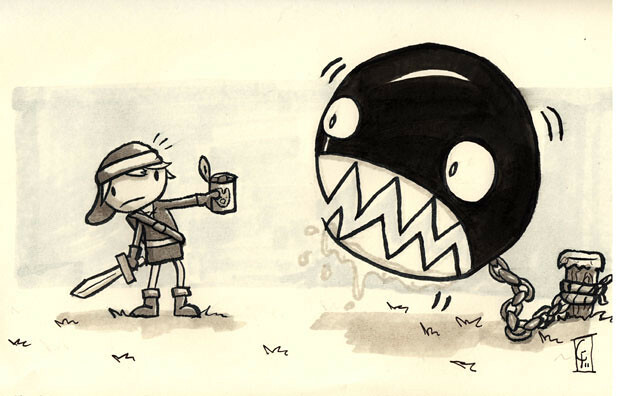 I mean, there’s cameos by other Nintendo characters all over and you can walk a Chomp on a leash. And there’s Goombas for some reason. Hope you enjoyed it! As always, comment are welcome.